In order to maintain a healthy body which of course is core to a healthy mind, it’s crucial to stay organised! In our busy lives we often forgo nutrition for convenience so I wanted to demonstrate a two part healthy breakfast recipe. Firstly, my Protein Granola, once you make this you will never go back to store bought. The freshness and crunch, combined with the ability to customise the ingredients to whatever your tastes desire is what makes this special. Take 30 minutes of your Sunday to prepare this and you’ve got breakfast sorted for weeks. Secondly, my superfood bowl, don’t be intimidated by the exotic ingredients I’ve used. Take the concept of combining some yogurt, home made granola and fresh seasonal fruit and run with it. Again, like most of my recipes, I encourage experimentation. Go to your local grocery store and pick the most seasonal delicious looking fruit, slice it up fresh in the morning and you’re laughing. I’ve also made a chia pudding, you may have seen these in the store and been intimidated, but as you will see it’s ridiculously easy. All it takes is a handful of chia seeds combined with a liquid of your choice – water, nut milk or even juice! Put it in a sealed container in the fridge and it will last around a week, did I mention breakfast sorted? The last and most fun elements I’ve used are the bright, colourful, healthy superfood powders that I sourced from Unicorn Superfoods. Life is better in colour and I can’t believe that these vibrant powders are all natural with no additives! Plenty of studies have shown evidence that the presentation of food actually does make it taste better! This is a great way to get children in the kitchen and excited to eat something healthy too. 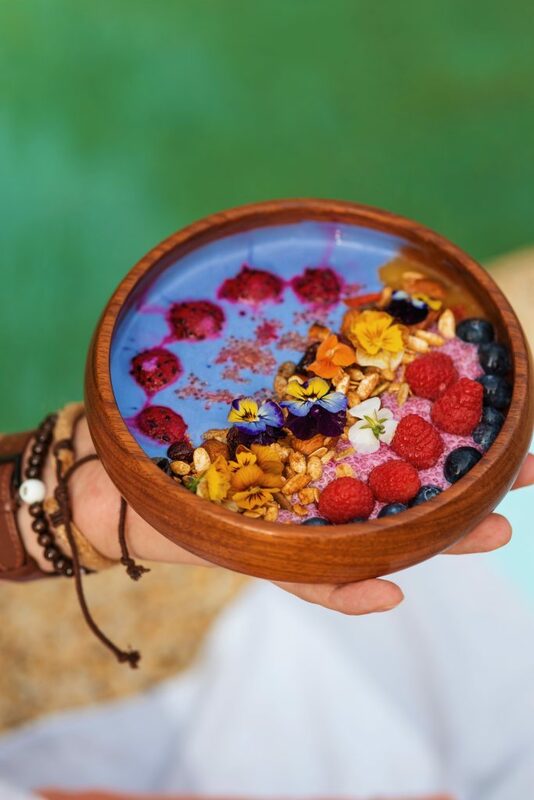 Unicorn Superfoods have also done their research and have indicated the potential health benefits for each of their superfoods. Ok enough preamble, watch the recipe and read the steps below. You will notice that my recipes are more food for thought than a strict set of rules. This is because, the best way to learn to cook is by experimenting. Try things and get it wrong, at least you’ll know what not to do in the future! This will give you that “chef’s intuition” for what sounds right. Nuts – choose your faves! I chose almonds, sunflower seeds and pumpkin seeds. Dried fruit – I used goji berries and cranberries. Again, choose your faves! I saw dried blueberries at the store the other day, they are definitely going in next time! Mix the oats, puffed rice, nuts and seeds together. Pour the melted honey over oats mixture and mix well. Place in a shallow baking tray and smooth out into a thin layer. Bake for 25-30 mins at 150C, stirring occasionally to ensure it doesn’t burn. You’ll know when it’s ready, that delicious nutty aroma will fill your house. Remove from oven, sprinkle over the cinnamon powder and stir in the dried fruit. Let it cool to room temperature before placing in a sealed container. The cooling releases moisture which helps it store better. This is the creative part! The main ‘recipe’ here is the chia seed pudding, for the rest, tailor it to what is seasonal, fresh and to your taste. For instance, I found a very cheffy Australian native ingredient called finger lime and couldn’t resist trying it out. And who can resist edible flowers! Natural yoghurt – read the label!! I don’t want to see any added sugar, gelatin or other funny things in there. Ocean Blend Superfood powder – same deal, be an artist! Mix the chia seeds, almond milk, pink pitaya powder and honey together thoroughly. Place in the fridge until set. Slice up the frozen mango cheeks, place in a blender with lime juice and pulse. Add a little water if you find it’s not blending. Get creative in the bowl!